Launched in 2005, The founders of Baby Abuelita's goal was to develop products to educate children on Hispanic traditions and cultures as well as teach practical lessons, including English and Spanish vocabulary. Since we are raising our 18 month old son in a Bilingual home, I was extra excited to get the opportunity to review the Baby Abuelita Products. My husband's parents were born and raised in Cuba. They met and started a family in Miami where Hispanic traditions and cultures continue to live. When we had our son in 2008 we knew that it would be important to enrich him with the Spanish language and culture and be educated in the history of my husbands side of the family. My son enjoyed the Baby Abuelita products, especially the Family Fiesta Dvd. The characters in the Dvd made learning spanish fun, which is the best way to introduce a child to a second language. In the Dvd, Abuelito (Grandpa) Pancho taught his grandchildren about their Hispanic culture through catchy tunes and fun dialogue. My son loved the music, clapping his hands and dancing all around! 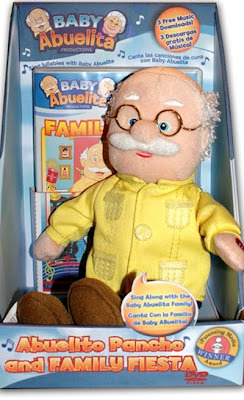 The Dvd also came with a mini Abuelito Pancho plush doll, which is just too adorable with his detailed stitching and little glasses. We also loved the Sing Along with Abuelito Pancho Lullaby music Book. I have heard my Mother in law and Great Mother in law sing to my son many of the songs that are in the book. Since I don't speak Spanish, it was nice for me to see the words (in English & Spanish) on the page and hear the music along with each song! Where can you buy Baby Abuelita Products? Baby Abuelita Products are currently being distributed to more than 3,000 stores including Wal-Mart, Kmart, Target, Toys R Us, and Sam's Club as well as http://www.babyabuelita.com/. Find a location near you. Post about this giveaway on your own blog! Ends at 11:59pm est Tuesday November 10th. One winner will be randomly drawn using random.org from all the entrants and posted shortly after the giveaway ends. Check back Every Wednesday until Christmas for a new Giveaway! I think the products are cute, I have been wanting to teach my son spanish. I like the videos on the site too! The dvd's looks like something my two kids would watch, your right the music is catchy! I went to the site and the kids are loving the Fiesta time song. I have never heard of these videos before but will look into finding them. We are also trying to raise the children bilingual! 14.99 is reasonable for 3 episodes! I like that my kids can have fun learning with these. Thanks for the chance. I really like it and the music is really catchy! This is a great way to teach kids Spanish. These look like great products, I would love to give this doll to my nephew to get him started on Spanish while he's so young! Looks like fun and a great learning tool! As a Latina, I love for products that expose our culture to my son. He is 15 months old right now and is just absorbing everything. I think the Baby Abuelita will be a gift he would enjoy for many years. As my 15month old says, "draciaaaassss" (Gracias). I think this program is awesome! I will really be looking into getting some of these dolls and DVDs for my son. I would really like him to start teaching him to be bilingual. I've seen the abuelita and abuelito dolls in the stores, but didn't realize they had so many different products!! I subscribed to your site! I love the DVD's. My son is now learning Spanish at a very young age in school and my 2 year old just loves this kind of stuff. I think the DVD's are perfect to help reinforce what my son is learning in school. I love that it is a fun way to learn spanish and the music is really catchy. What a great idea! I really want to teach my son Spanish! He would also love the slippers! Being bilingual is such a necessity in today's world. What a wonderful way to help children learn. Cute and I love they sing. I like that they combine the spanish language with music. I think they are great! Like you, we are raising our little one in a bi-lingual home as best as we can. I love the bilingual quality of these toys, as Spanish is more and more a needed language to learn in our country. I am all about fun + education and these toys have both!!! These look like great products. I think that it is important for my grandson to be bilingual. I have been wanting him to learn to speak Spanish and feel that Abuelito (Grandpa) Pancho would be a fun way of accomplishing this. I really think this is a GREAT product. I would love for my son to learn a different language:). Wow, what a great thing for a child. I think it's a great tool to teach my kids spanish. The plush toys are cute. I think my daughter would really love Baby Mimi!! The products look great! My husband and I are Caucasian and we have adopted a wonderful Hispanic boy. I can speak some Spanish, but I would love to teach our son Spanish and my husband too. We have a multicultural/ethnic family that we think is wonderful and we'd love to include language as one of our multicultural strengths. I think they are so sweet and such a great learning tool. The grandpa and grandma and kids all look so adorable. I am subscribed to email already. I think the dolls look fun and the music will be helpful to learn new words. I love the products and think they are awesome for encouraging Spanish language development. I found out they won the 2007 National Parenting Publications Award for Baby Andrea. The music is very snappy. I think it would keep the kids attention. What a great way to learn about another culture. Thanks! I subscribed and confirmed e-mail. Thank you for posting this review! I have been trying to find a product like this for my nephew who is also being raised bilingual!! I am going to check walmart next time I go! I feel it's important for my son to be bilingual to incorporate both parent's heritages. I think these products are fun ways to help teach my son Spanish. I'm definitely going to get Baby Tita for him for a Christmas gift. Inside the following areas, Snapchat Login geconfronteerd met dit probleem op Vodafone we will have the information of exactly what you can do with Check this Website Snapchat Login.Download and install Bluestacks from online snapchat the official website.Install Bluestacks on your PC after downloading.this is just for Snapchat Login taking care of one Snapchat account. DANA'S صيانة التكييف بالرياض, Petitioner, v. Sandra Watts. BUTTERFIELD and The Industrial Claim Appeals Office of the State of Colorado, Respondents. If you desire of walking into an spotless house without taking the time or attempt, we are ready to help. We maintained our initial customer in early 2008, and in 2010 I chose to rounded out my business understanding by signing up in business college. For us we have found it works best to hire someone by the hour for the first 4 cleanings with an agreed plan of what will be done and the potential period body allowed to execute the tasks. At my former location elsewhere in the state I had an 3rd party washing team for over 30 years. If you have got a great washing person, deal with them well. Depends about how microbe infested مين جربت شركات تنظيف المنازل بالرياض your home is usually in. I was a professional cleaner. I possess right now spoken to 3 different 3rd party cleaners, and they all say, "I charge for the job, not matter how long I am there". The right شركة تنظيف شقق بالرياض and maid service work can transform your home's appearance and free up your time to spend your non-work hours on the activities and people you love. For 7 hours of function. Different function, but many times I have always been even more depleted from washing than my medical work! We are an eco-friendly business, dedicated to safeguarding the environment with sustainable washing components. Some cleaners will make use of the same sponge or publication for everything, EWWW. In some expresses, genuine property buy agreements stipulate that the house is certainly to end up being "broom كيفية تنظيف خزانات المياه البلاستيكية clean," signifying the seller should at least mop the floor, and leave walls and ceiling bare. However, I have let cleaners go for inflating their hours, the same as a previous poster. My wife and I do مكنسة المسبح, $80 is certainly our that gets you 2 people for 2-4. If I can't clean something with the cleaner provided I will let the owner know immediately. Planting season dust and sandstorms leave the difficult corners of the house dusty and can cause allergies; and summertime often needs a great washing of drapery and home furniture.